If you’re a writer, chances are you love language but hate grammar. The truth is, you don’t need perfect grammar — that’s what professional copyeditors are for, and it’s not like editors will tally up your misused commas until you make one too many and your manuscript is chucked into the digital trash. That being said, an extreme amount of grammatical mistakes can come across as sloppy, or even legitimately be a stumbling block for reading. Grammar rules can be difficult to learn, but don’t worry. 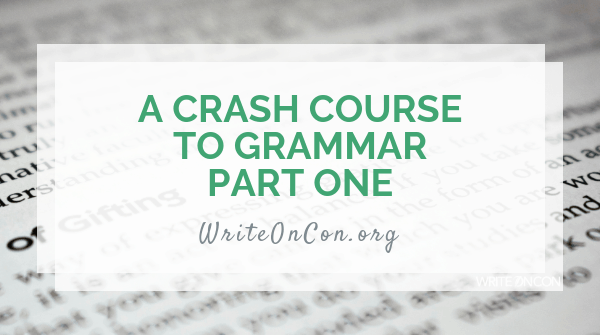 Here’s a crash course to some of the most common mistakes I’ve seen as a copyeditor. 4) If you have two or more adjectives modifying the same noun, you typically use commas if the commas could be replaced by an “and” without changing the meaning. If an “and” would sound off, however, you probably don’t need a comma. For example, “my wonderful, adorable dog” means the same thing as “my wonderful and adorable dog.” However, you wouldn’t describe Clifford as a “big and red dog”, so “big red dog” is fine. A quick guide to tense: “I say” is present tense. “I said” is past tense. “I had said” is past perfect tense, which indicates that an action was completed at some point in the past before something else. “I will say” is future tense. Compare the verbs: were and didn’t are past tense, is, wake, stretch are present tense. You may notice that not all the verbs are in past or present tense in either paragraph: in Harry Potter, you have “the last people you’d expect to be involved” (future tense), while in Hunger Games you have “she must have had bad dreams” (past perfect tense). Consistent tense use doesn’t mean that every single verb you write will be in past or present tense. In the cases above, “the last person you’d expect” is a hypothetical, so future tense makes sense. Similarly, while The Hunger Games is narrated in present tense from the point of view of Katniss Everdeen, Prim’s bad dreams happened the night before the moment Katniss is presently describing, in which she’s looking at the empty bed in the morning. So tense will change depending on context, but otherwise they should be consistent. “Mr. and Mrs. Dursley were perfectly normal and don’t hold with such nonsense” or “When I wake up, the other side of the bed was cold” would NOT be correct. Semicolons are NOT just “fancy commas”! In fact, unlike commas, semicolons only have a few specific uses. However, this also means that you have to learn when to use them correctly, because while you may have some leeway with commas, semicolons really stand out when they’re misused. Independent clauses are independent because they can be their own sentence. Dependent clauses are dependent because they can’t. “David was so funny” is an independent clause; “because David was so funny” is a dependent clause. Tune in next week for Part 2 of this series, with some common mistakes to avoid.